Effectively track your sales in Nutshell by changing the status of your leads. You can close a lead with three statuses: won, lost or canceled. When you make a sale, you will change the lead's status to "won". Read more about showing sales in reports. 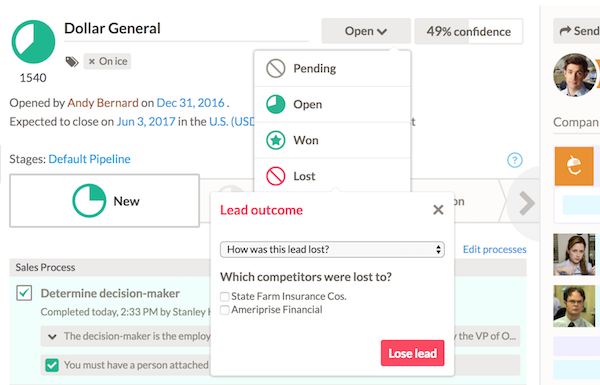 For better reporting on your lost and canceled leads, you can set up different outcomes. For example, you may want to track leads that were lost to a competitor vs. leads lost because of an inadequate budget. You can then use the Losses report in Nutshell and segment by Outcomes to report on this data. Check out our video tutorials for closing leads in Nutshell! When you click "Won," a dialog box will prompt you to confirm and finalize the pricing of the products. After a lead has been won, its value will be added to the Sales section of the Metrics Card on your dashboard and will be moved from Pipeline to Sales to Date in your forecast reports. Canceling may mean that your team canceled the lead due to requirements that were not met, as opposed to the company or person backing out (Losing a lead). Click here to learn how to configure outcomes. You can also use the "Edit all" function, in the lower left corner of the Leads list, to apply a new status to a group of leads.